Two mini-satellites will test elevator motion in space as part of research for an elevator between Earth and low orbit. The problem with rockets is that they are very expensive, mostly single use and occasionally have been known to explode. That is why for over a century scientists and sci-fi writers alike have dreamed of creating a space elevator to ferry astronauts and payloads between the Earth and low orbit. Building this “celestial castle,” as Russian scientist Konstantin Tsiolkovsky first envisioned back in 1895, has so far proven beyond the grasp of existing technologies. But that hasn’t stopped people from trying. Now, as Agence France-Presse reports, researchers at Japan’s Shizuoka University will test elevator motion in space next week in a first-of-its-kind experiment in hopes of advancing the concept. Tsiolkovsky originally came up with the idea of a space elevator after seeing the newly constructed Eiffel Tower. The space pioneer realized that a similar tower could be built to extend all the way to the stars. But it would take more than half a century until another Russian, engineer Yuri Artsutanov, began to look into the real-world challenges of building a permalink between the Earth and space in the 1960s. Theoretically, a “space elevator” would be composed of a cable tethered to the Earth, likely somewhere near the equator where hurricanes and tornadoes are scarce. David Smitherman of NASA/Marshall’s Advanced Projects Office, explained that such a system “requires the center of mass be in geostationary orbit,” roughly 22,236 miles above Earth’s equator. The cable itself would need to be tethered to a stationary mass beyond geostationary orbit that would keep it taut. But the result would allow for electromagnetic vehicles to ride up and down the cable taking workers, equipment and tourists into orbit for a fraction of the cost of a rocket ride. Of course, there are hurdles in the way of executing that idea. Currently, no material has proven strong enough to survive the stresses placed on the elevator cable by the tug of gravity and wind in the upper atmosphere. Even carbon nanotubes, the strongest material we’ve devised so far, would shred under the stress. Then there are problems like developing electromagnetic vehicles to ride the cable and finding a suitable counterweight, like a small asteroid, that could be moved into place to tether the cable. Nor is it clear how an elevator would work in zero Gs. That’s where the Japanese study comes in. AFP reports that the researchers are launching two tiny cubic satellites aboard an H-2B rocket next week bound for the International Space Station. The roughly 4-inch cubic satellites will be deployed from Kibo, a Japanese Aerospace Exploration Agency-owned module, with a 33-foot steel cable between them. An even smaller motorized cube will function as its elevator car, moving along the cable between the satellites. The researchers will monitor the action via camera to study how the systems works in orbit. “It’s going to be the world’s first experiment to test elevator movement in space,” a university spokesman tells the news agency. 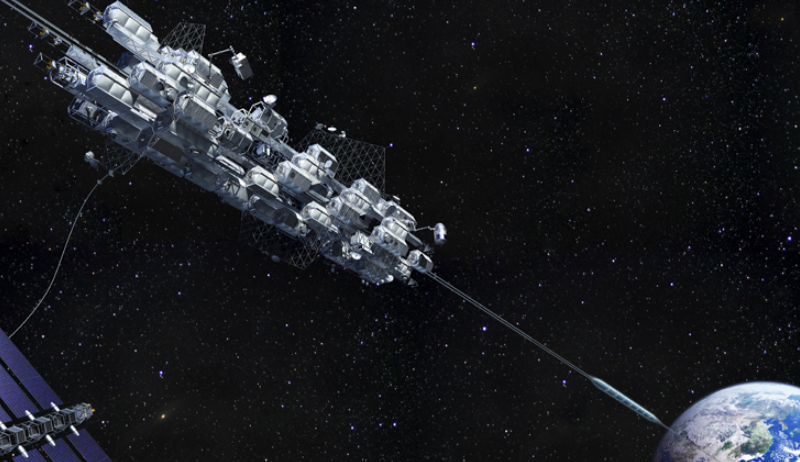 While the challenges to creating a space elevator are massive, that hasn’t deterred Japan from continuing to invest in the idea. “In Japan, the space elevator is practically a part of the national psyche due in part to a deep expertise by Japanese researchers in the fields of robotics and carbon nanotube technology, starting with the 1991 discovery of carbon nanotubes by Japanese researcher Sumio Iijima,” as Michelle Z. Donahue explained for Smithsonian.com in 2016. According to Japan’s national daily the Mainichi, the Obayashi Corporation, which built that nation’s largest tower, has already put together a space elevator proposal. In its concept, six oval-shaped elevator cars would move between a platform in the sea and space station orbiting Earth. A trip from the sea to the sky would take an estimated eight days. The idea relies on carbon nanotubes or an as-yet-undeveloped material and require almost 60,000 miles of cable. The price tag for the concept is estimated to be around $90 billion (10 trillion yen). Putting aside the technological problems for a moment, there remains another hurdle engineers have yet to address: how are we going to print an “Out of Order” sign big enough to read from space?